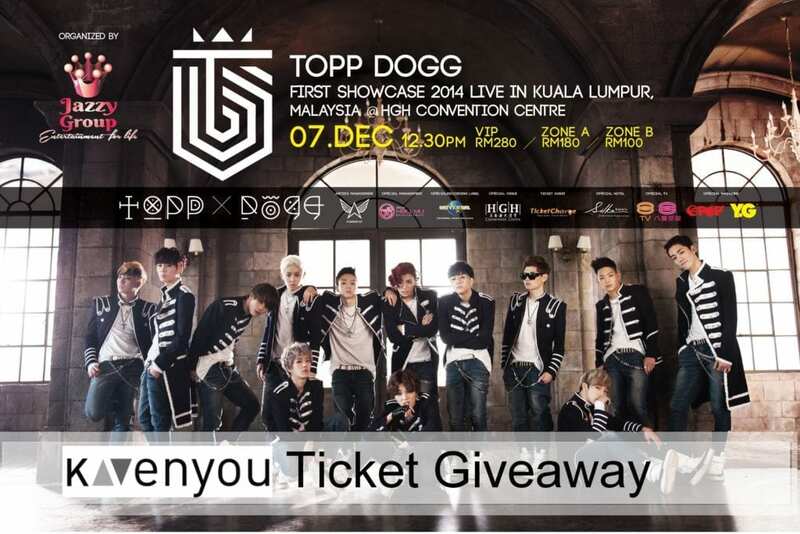 KAvenyou is giving you a chance to catch TOPP DOGG First Showcase 2014 Live in Kuala Lumpur for FREE! TOPP DOGG First Showcase 2014 Live in Kuala Lumpur, Malaysia 2014” will be held at HGH Convention Center, Kuala Lumpur on 7th of December 2014! Topp Dogg was formed by Stardom Entertainment in 2013. Consisting of Jenissi, P-Goon, Seogoong, Gohn, Hojoon, Kidoh, Sangdo, Nakta, Hansol, B-Joo, Xero, A-Tom and Yano, the group is one of the least Korean pop group which consist 13 members in a group a record which fellow Korean heartthrob, Super Junior has also held. Known for their powerful dance routine and charismatic on-stage performance, Topp Dogg is arguably one of the rising star for which the Korean pop industry could offer in recent times. Check out our Facebook page and you will know!